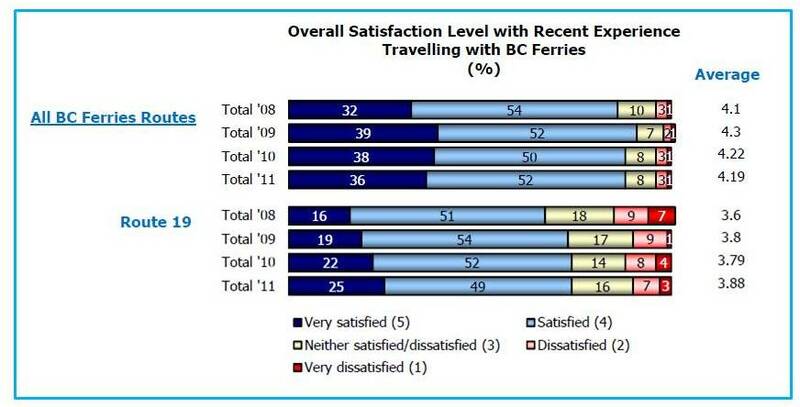 Results of the 2011 Customer Satisfaction Survey conducted the Mustel Group for BC Ferries revealed some mixed outcomes, but little overall change in customer satisfaction levels. Across all routes, 88% of BC Ferries’ passengers said they were satisfied with the overall service provided – down only slightly over the previous two years. Compare this with route 19 to Gabriola, where only 74% of passengers expressed satisfaction with the service; far fewer than many of the ‘leisure’ routes but actually maintaining the steady improvement that has been evident on the route for the past few years. Satisfaction with on-board facilities is below average for route 19 too – with 79% of satisfied users on the Gabriola route compared to 88% across all routes. Not surprising maybe, given the limited facilities for passengers aboard ‘Quinsam’ – but once again, a noticeable improvement on previous years. Contributing to the overall improvement, Gabriolans pointed to greater satisfaction with the ferry schedule, fewer overloads and more on-time departures – reporting the highest satisfaction in these areas for the past four years. Gabriola passengers are rather less happy with some of BC Ferries’ local terminal facilities than they were in 2010; the lack of car parking spaces and seating arrangements in terminals both hit satisfaction levels this year. BC Ferries’ customer services also hit a four-year low in customer satisfaction this year with the website, reservations and telephone services all receiving fewer satisfied customers. So what’s the biggest gripe among Gabriolans? Fares, of course. Value for money is at its lowest level since 2009 and Gabriolans seem to be even less happy about that than most.